Bahama Berry, also known as Pineapple Verbana or Moujean Tea is a rare evergreen shrub native to the Caribbean. Crushed leaves emit the aroma of sweet honey, vanilla, and citrus. Flowers have a jasmin-like fragrance and bloom in the late summer through fall and produce tiny orange berries. 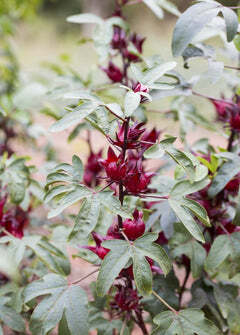 This tropical perennial shrub is sometimes used for Bonsai. Pollinators, especially butterflies, love the flowers and sweat aroma of Bahama Berry blooms. Flowering & Harvest Season: Late Summer to mid-Fall. Can be harvested year round. Soil & Moisture: Rich, moist, well-draining soil with consistent moisture and humidity. Climate Zones: USDA plant hardiness Zones 9+ but can be grown as an annual in other zones.